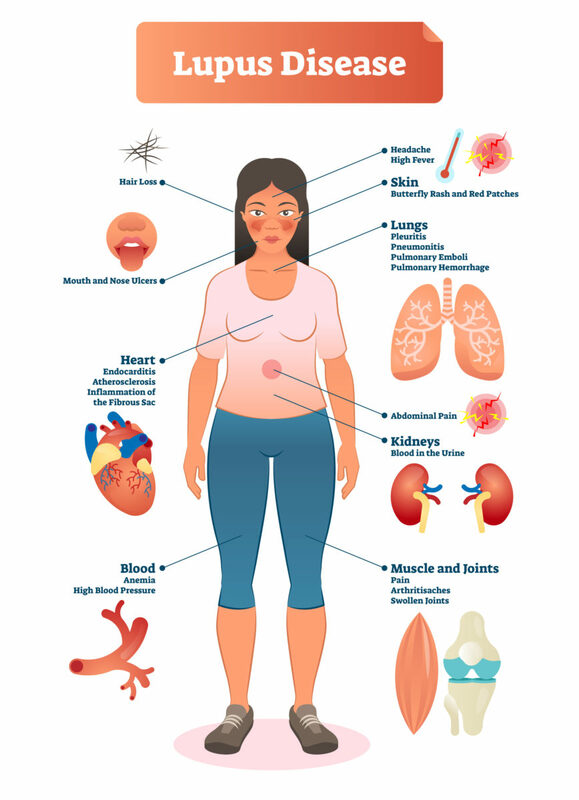 Autoimmunity is the underlying cause of more than 100 serious, chronic illnesses, targeting women 75 percent of the time. Arthritic conditions commonly present with joint swelling, pain, stiffness and decreased range of motion. Each of these symptoms can fluctuate in severity, frequency, and duration. Chronic pain can contribute to a decline in daily activities and quality of life. Some types of arthritis also affect the heart, eyes, lungs, kidneys and skin as well as the joints. Medical treatment for mild or moderate arthritic conditions can include: oral medications, physical therapy, rest balanced with exercise, a healthy diet with weight management and avoiding excessive repetitive movements. We treat many types of inflammatory and autoimmune conditions with biologic medications at ARISE infusion therapy centers. 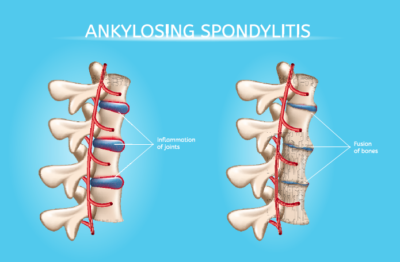 Ankylosing Spondylitis is a rare autoimmune disorder affecting between 0.2 – 0.5 % of the general US population. It belongs to a group of diseases known as spondyloarthopathies. Spondyloarthropathies and Ankylosing Spondylitis in particular are more commonly seen in men between the ages of 20 and 40, although they can affect anyone regardless of age or gender. AS, is a form of arthritis that primarily affects the spine, although other joints can be involved. This disease is due to Inflammation, more commonly with the spinal joints (vertebrae) develop that can lead to severe, chronic pain and discomfort. It is not a mechanical form of arthritis. In more advanced cases this inflammation can lead to ankylosis — new bone formation in the spine — causing sections of the spine to fuse in a fixed, immobile position. In a minority of individuals, pain does not start in the lower back, or even the neck, but in a peripheral joint such as the hip, ankle, elbow, knee, heel, or shoulder. This pain is commonly caused by enthesitis, inflammation of the site where a ligament or tendon attaches to bone. Diagnosing disorders like AS can prove especially challenging as there are limited blood tests and imaging studies that can effectively evaluate patients with the condition. HLA B27 testing can be helpful in identifying those patients with back pain who may be at an increased risk of developing AS, and X-rays and magnetic resonance imaging (MRI) can help to look for joint damage associated with inflammation. Rheumatologists use a combination of blood tests, imaging studies, and your clinical history to arrive at a diagnosis of Ankylosing Spondylitis, and once the diagnosis is established he / she will help to determine appropriate therapy. Use of anti-inflammatory medications (NSAIDS) and biologic medications which can be given as an infusion or an injection. 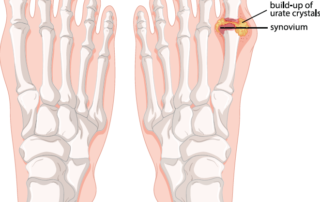 Gout is an ancient disease, with its earliest descriptions dating to the time of Hippocrates. It is a painful affliction of the joints caused by deposits of crystals derived from uric acid. 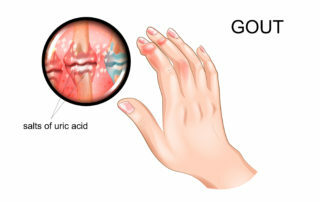 There are few disorders as painful as gout, turning those in the throes of an acute attack into a state of helplessness. Early on in the course of this disease, flare-ups occur infrequently, last a week or so, and resolve on their own or with the help of medications that fight inflammation. Over time, attacks become more frequent, last longer and involve an increasing number of joints. 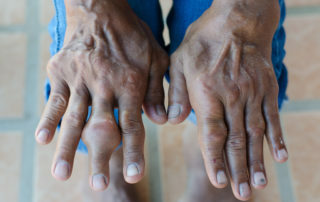 Eventually, if not controlled, gout sufferers may develop persistent joint pain, swelling, deformity and disability. In the most severe cases, lumps composed of crystalline uric acid form on the joints and in other tissues. 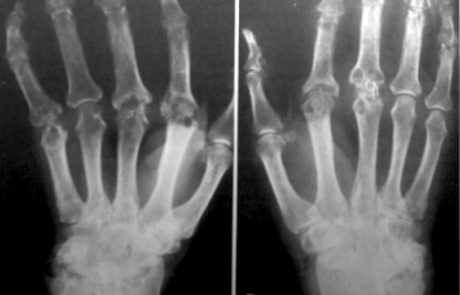 These lumps, called tophi, can be quite disfiguring and may interfere with ordinary joint function. The management of gout involves two important steps. The first is to control the severe attacks by inhibiting inflammation with medications like colchicine, ibuprofen or naproxen. The second, as attacks become more frequent, is to mobilize and eliminate the uric acid derived crystals from the joints and surrounding tissues. In essence, first fix the pain and then clear the body of excess amounts of uric acid. In rare cases, patients may need intravenous treatment with a uric acid lowering agent called pegloticase (Krystexxa). 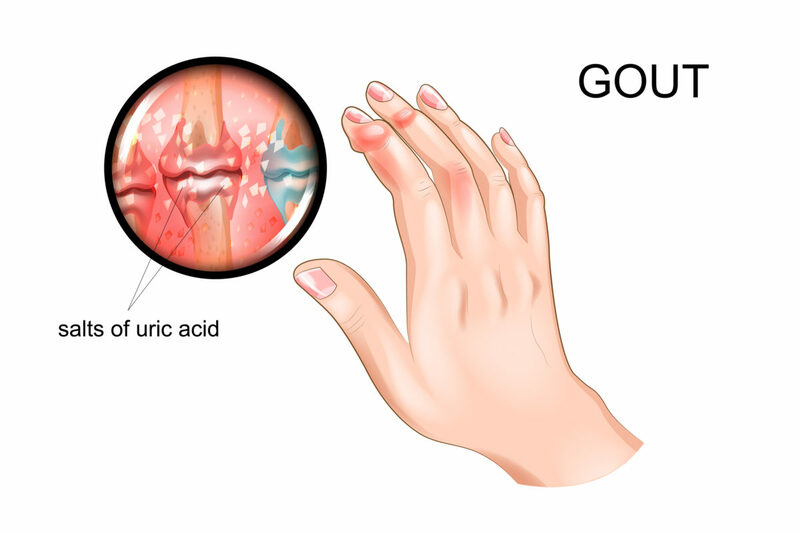 Working with a rheumatologist is the best way to determine the right therapy for patients with gout. 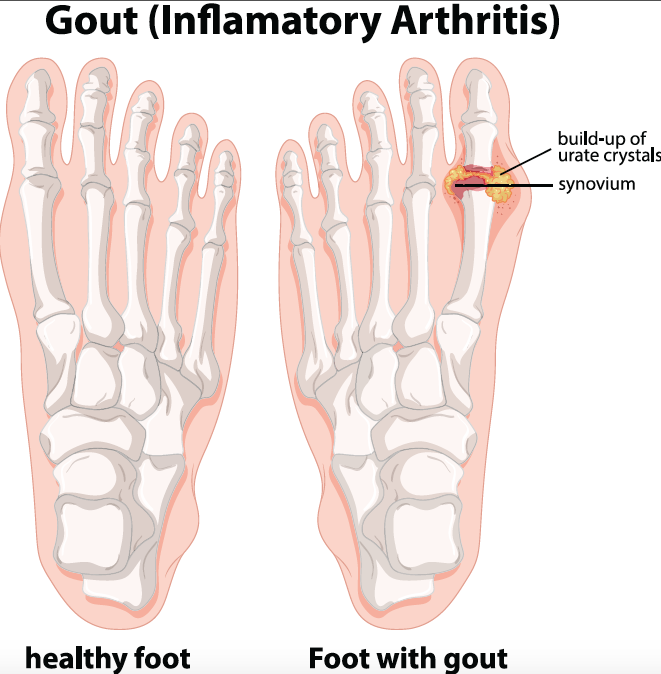 Additional information about gout can be found Here. 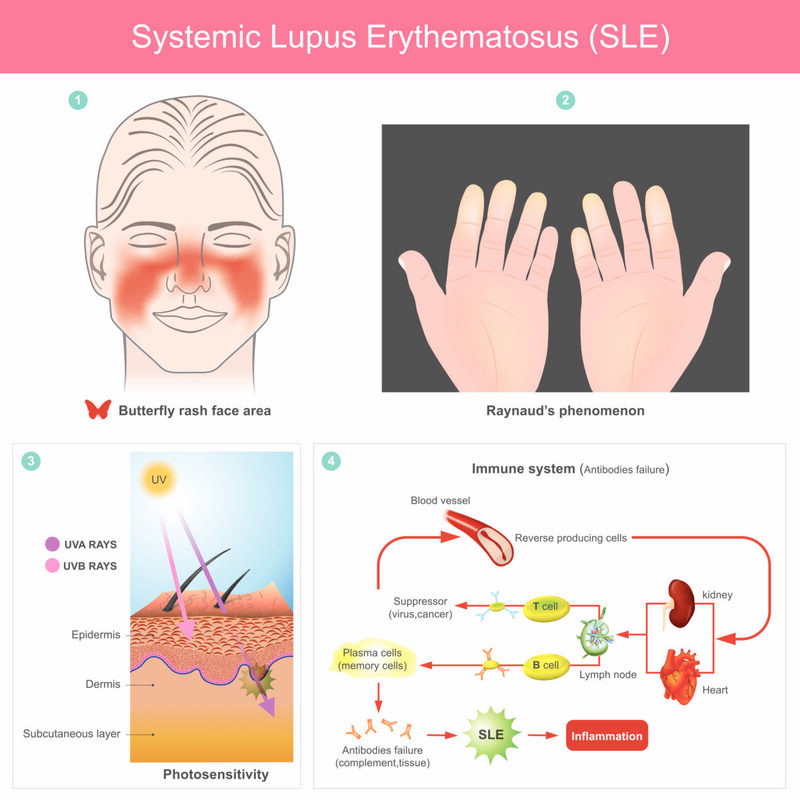 Systemic lupus erythematosus (SLE), or lupus, is a systemic autoimmune condition that can affect any part of the body. 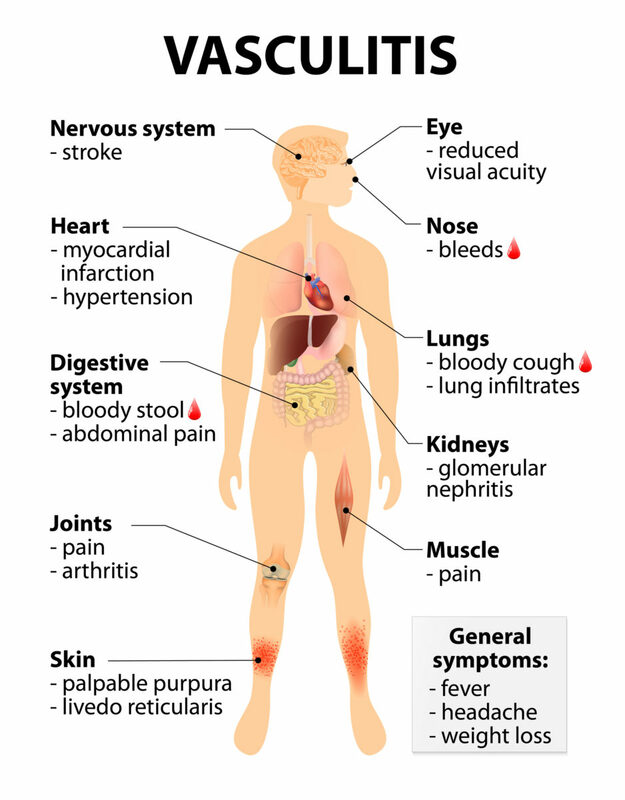 Autoimmune conditions are illnesses that occur when the body’s cells and tissues are attacked by its own immune system resulting in inflammation and tissue damage. Patients with lupus produce abnormal antibodies in their blood targeting tissues (autoantibodies) as opposed to foreign infectious agents. Patients present with a myriad of complaints and symptoms; it can affect the skin, heart, lungs, kidneys, joints, and/or nervous system. When localized to the skin, without internal disease, it is called discoid lupus. Only when internal organs are involved is the condition referred to as systemic lupus erythematosus. 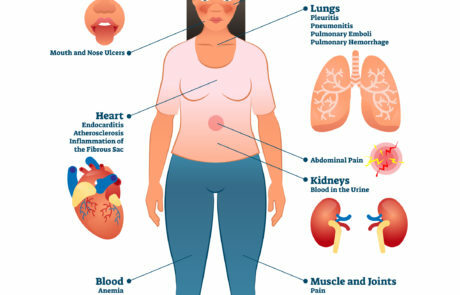 Lupus is predominantly a disease of women. It may present at any age, although its peak incidence is during the childbearing years, between 15 and 45, at which time the female-to- male ratio climbs, reaching a peak ratio of approximately 12 :1. It occurs worldwide, although it is likely under-recognized and under- diagnosed in developing countries. In the U.S., lupus is most prevalent among those of non-caucasian descent, with those of African heritage most affected. Poor circulation to the fingers and toes with cold exposure (Raynaud’s phenomenon). Complications may occur depending on the organ affected and the severity of the disease. Given its heterogeneous presentation, no single test can confirm and establish its diagnosis. A physician who specializes in lupus (rheumatologist) will evaluate the patient and make this clinical diagnosis. Lupus is a chronic condition, and there is no cure yet available. However, in many cases patients can achieve remission of symptoms with prompt, appropriate treatment. Currently, there are both oral and intravenous therapies for lupus, all of which serve to control the body’s overactive immune response. Rheumatologists and patients work together to determine appropriate therapy based on the individual’s symptoms. Additional information about lupus can be found Here. 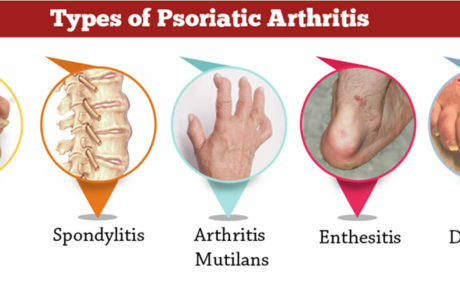 On average, psoriatic arthritis affects about 30% of patients who have psoriasis and generally occurs about 9 to 10 years after the onset of psoriasis. Often the diagnosis is delayed because patients with psoriasis are not aware that arthritis can develop as a result of their skin disease. Even some health care professionals are not aware of all the potential complications that can occur in patients with psoriasis. A delay in diagnosis is problematic because studies have shown that damage to the joints can occur in some patients when appropriate treatment is not started promptly. Psoriatic arthritis is an autoimmune disorder, unlike osteoarthritis which develops primarily as a result of “wear and tear” on the joints. This means that, as with rheumatoid arthritis (RA), the immune system erroneously attacks the joints causing inflammation and damage. 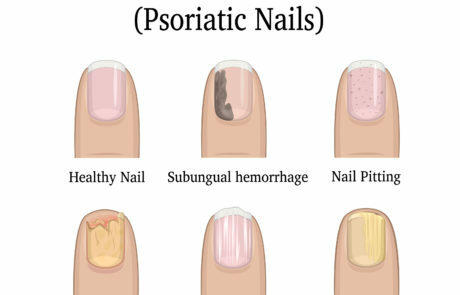 However, psoriatic arthritis falls into a group of disorders that is distinct from RA, known as the “seronegative spondyloarthropathies” or SPA, which share similar or overlapping features. This group includes psoriatic arthritis, ankylosing spondylitis, arthritis associated with inflammatory bowel disease such as ulcerative colitis or Crohn’s disease, and reactive arthritis (arthritis that occurs secondary to an infection such as food poisoning or bacterial infection). These disorders share some genetic and clinical features, and may share some biologic characteristics that lead to their development. 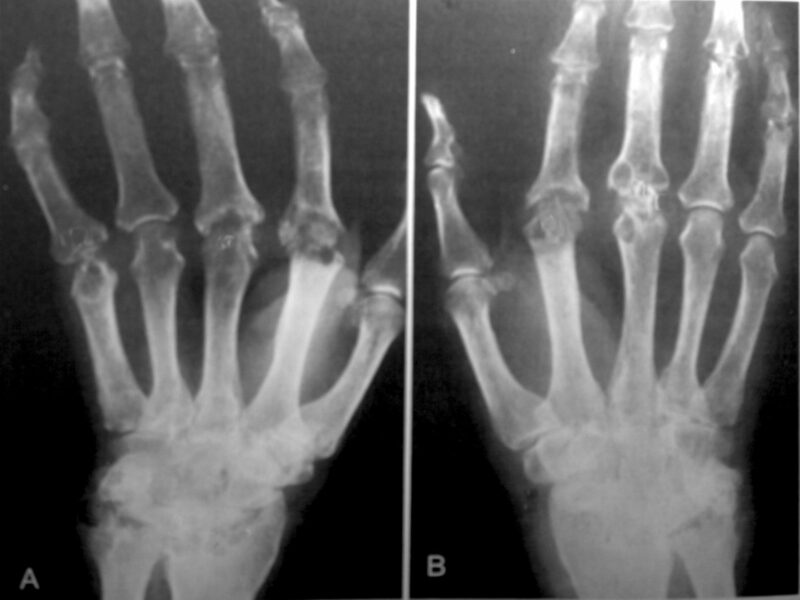 The diagnosis of psoriatic arthritis is based on symptoms and findings in the musculoskeletal system of a patient with current or past psoriasis or a family history of psoriasis. Joint symptoms typically include swelling, redness and warmth of a few or many joints, often in an asymmetric fashion. What is frequently different about psoriatic arthritis when compared to RA is prominent involvement of tendons and “entheses,” the area where a tendon or ligament attaches to bone. “Enthesitis” is present in many common conditions such as tennis elbow, plantar fasciitis and Achilles tendonitis. 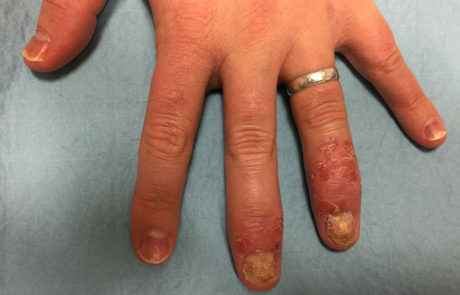 When these problems are occurring repetitively or in a chronic, non-healing fashion in a patient with psoriasis, the diagnosis of psoriatic arthritis should be considered. 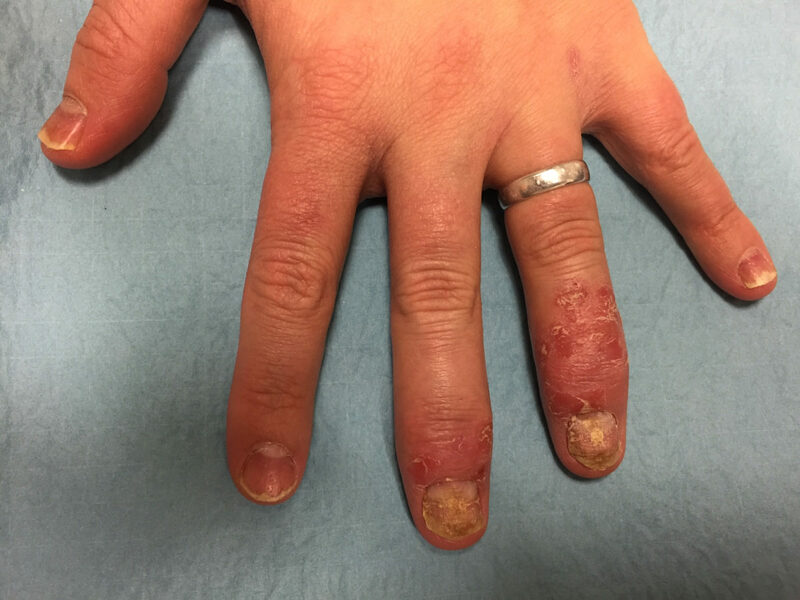 Another common feature of psoriatic arthritis is dactylitis, often called “sausage digit.” This is a very painful and sometimes disabling problem which involves swelling of an entire finger or toe. We now know that dactylitis is due to swelling and inflammation of all the tissues within a digit including the joints, tendons, entheses and bone. The spine can be involved in about 40 percent of patients, but it is rare for the spine to be the only area involved in psoriatic arthritis. Spine involvement is felt as inflammatory-type back pain. Inflammatory back pain is different than routine mechanical back pain in that it is slow as opposed to abrupt in onset, and gets better with activity and worse with rest. Inflammatory back pain frequently awakens sufferers from sleep at night. 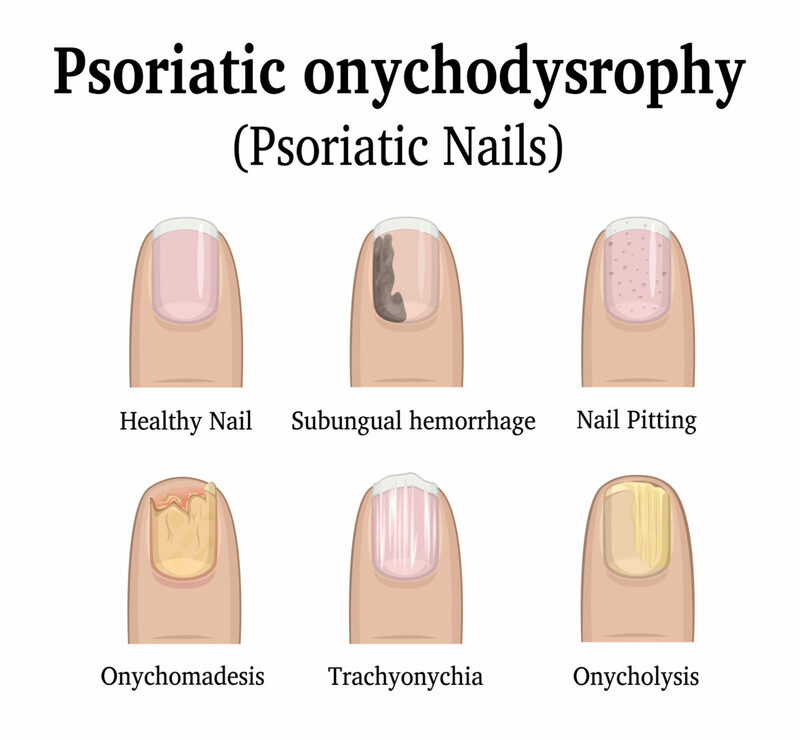 Once the diagnosis is made, a patient’s condition is characterized as mild, moderate or severe based on disease activity assessed in all five areas of involvement in psoriatic arthritis (PsA). 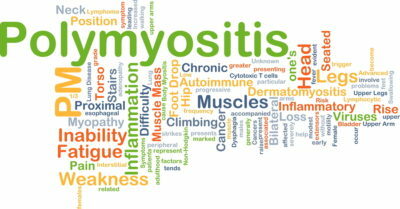 These areas include: the severity of skin disease, arthritis, back pain/spine involvement, dactylitis and enthesitis. Psoriatic arthritis can also increase risk of cardiovascular complications (hypertension, heart attack and stroke). Psoriatic arthritis is a potentially progressive disorder that not only can affect skin, joints, tendons and spine, but also can increase the risk of heart attack and stroke. Early recognition of this condition that allows appropriate treatment to begin is essential for relieving ongoing symptoms and possibly preventing future damage and disability. Treatment is prescribed based on the severity of the disease, with milder therapies for mild cases and stronger medicines for severe disease that interferes with function. Treatment may include non-medical interventions such as physical therapy and exercise. Weight loss is important for many patients with PsA, as increased weight has been shown to not only increase the risk of developing this disease, but also to decrease effectiveness of medicines. Prescribed medications may include non-steroidal anti-inflammatory drugs (NSAIDs) such as ibuprofen or naproxen), standard disease-modifying antirheumatic drugs (DMARDs) such as sulfasalazine, methotrexate and leflunamide) and biologic therapies such as Enbrel, Humira, Remicade, Cimzia, Simponi, Stelara, Otezla and Cosentyx. Biologic agents are medications that interfere with inflammatory activity in the body. These agents help with the symptoms of both psoriasis and arthritis and some may help stop progression of the disease. 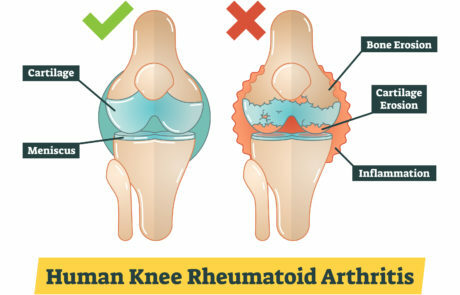 The possibility of serious side effects exists with these and all medications, and should be discussed carefully with a rheumatologist to fully understand the risks and benefits before starting any new therapy. New biologic agents are also in clinical trials and will be available for general use for psoriatic arthritis in the near future. Additional information about psoriatic arthritis can be found here. 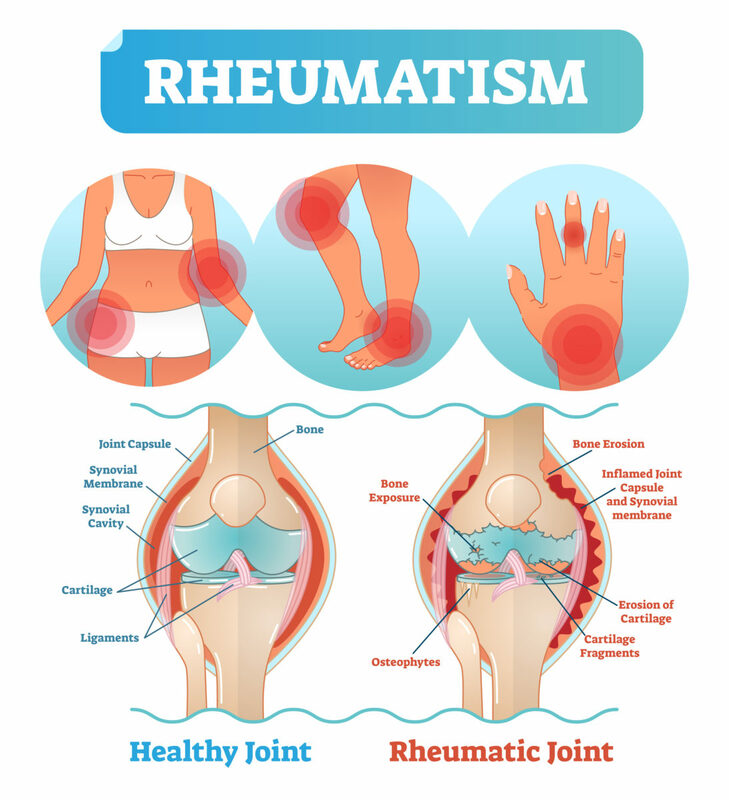 What exactly is rheumatoid arthritis (RA) and what can be done about it? 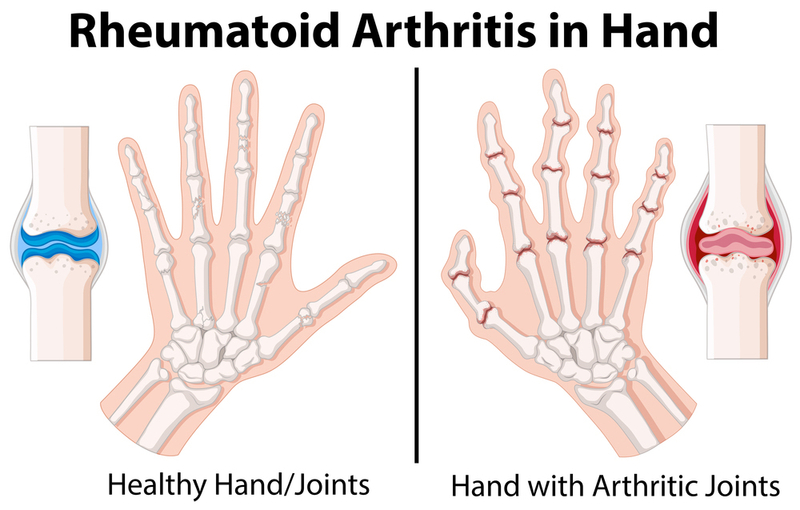 Rheumatoid arthritis is the most common cause of autoimmune arthritis. 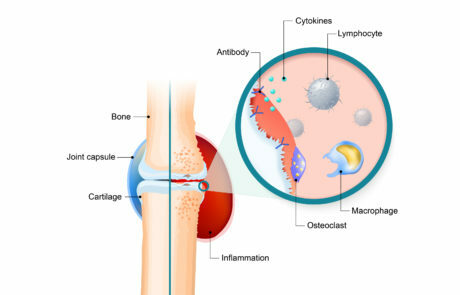 It is characterized by inflammation in joints created by the immune system. Usually the immune system helps a person fight off infections, but in the case of RA, it attacks the joints and other tissues. The cause is unknown. Joints of the hands and feet are most frequently stiff, sore and sometimes swollen. Other joints and the neck can be involved. Symmetrical in body such as same finger on each hand. Morning stiffness typically lasts at least a half hour. Dry mouth and dry eye. Sensations of pins & needles. Hand bump on the finger or swelling. 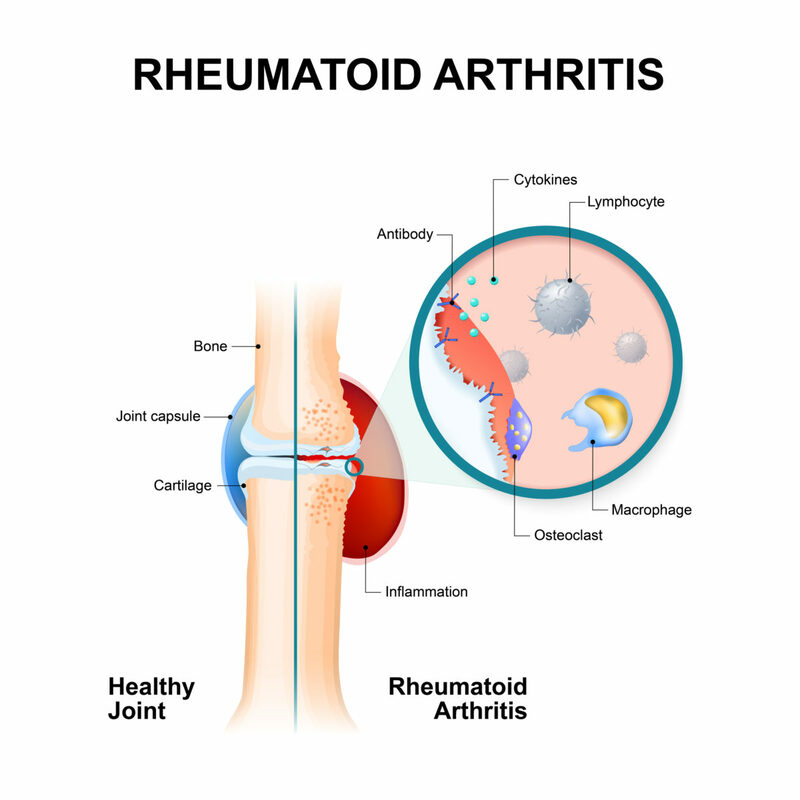 Rheumatologists – physicians trained in musculoskeletal and autoimmune diseases – can ask detailed questions and order lab tests, xrays and other tests if needed. This evaluation can distinguish RA from more common “mechanical” joint pains (wear and tear, injuries, and overuse) and other ailments such as lupus, fibromyalgia, gout, carpal tunnel syndrome, and Lyme disease. There is no specific treatment that works best for everyone with rheumatoid arthritis, so the strategy is to “treat to target”. A doctor and patient will discuss the best initial therapy. Most often this will be a “DMARD” (disease modifying anti-rheumatic drug). If RA has not improved enough once the drug has “kicked in”, then therapy can be augmented with other medicines. Several different kinds of medications can be used, ranging from pills to specialized home injections and in-office infusions. The process of getting RA under control may take 1 to 2 years; meanwhile anti-inflammatory treatments can help reduce pain and let people get back to their work, hobbies and lifestyle. Overall, rheumatoid arthritis is a very treatable disease. Specialized medications used in a “treat to target” strategy can prevent joint damage and disability. But there is no known cure for RA. It is hoped that future clinical research will identify not only new medicines, but also tools to predict which treatments will work in each specific person, and when medications might be stopped without provoking the disease to recur. 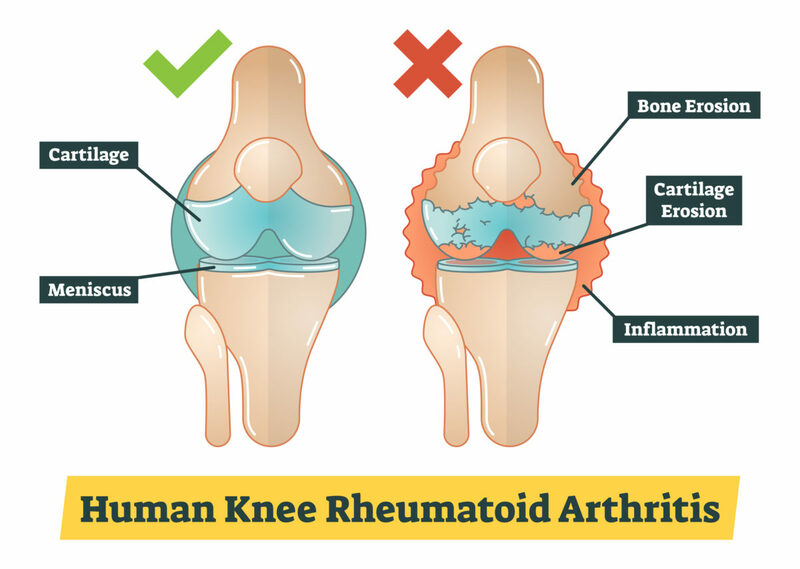 Additional information regarding Rheumatoid Arthritis can be found Here. Vasculitis literally means inflammation of the blood vessels. It is defined by the presence of inflammatory white blood cells in the vessel walls resulting in reactive damage and loss of vessel integrity which can lead to rashes, bleeding and tissue or organ damage. Vasculitis is a rare condition and can be a primary process, or secondary to another underlying disease or autoimmune condition. Vasculitis can affect people of any age, but some types occur more in certain age groups and ethnicities. Classically, they are categorized by the predominant sizes of the blood vessels that are affected, and also by the presence or absence of antineutrophil cytoplasmic antibodies (ANCA), which can be detected with specific blood testing. Large vessel vasculitidies include Takayasu Arteritis and Giant Cell Arteritis (GCA), or Temporal Arteritis (which occurs in about 15% of patients with Polymyalgia Rheumatica). Medium sized vessel vasculitidies include Polyarteritis Nodosa (PAN), Kawasaki disease, and primary CNS Vasculitis. Small vessel vasculitidies include Wegener’s (now named Granulomatosis with Polyangiitis or GPA), Microscopic Polyangiitis, Churg-Strauss. 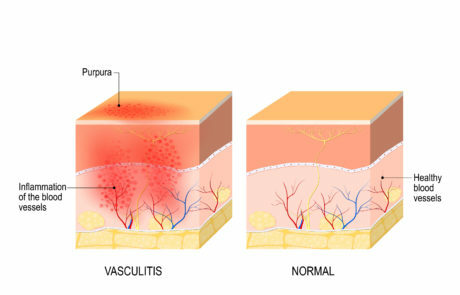 Vasculitis can be secondary to conditions like Lupus and Rheumatoid Arthritis or occur after e exposure to medications, or infections like Hepatitis B and C, HIV, CMV, EBV and Parvovirus. Diagnostic evaluation should consider age and gender, include a detailed history, including drug use, and infectious disease exposures. General labs should be obtained to identify which type of disorder is present and the degree of organ involvement if any. Treatment depends on the nature, severity and type of vasculitis, as well as what organs are affected and to what degree they are affected. 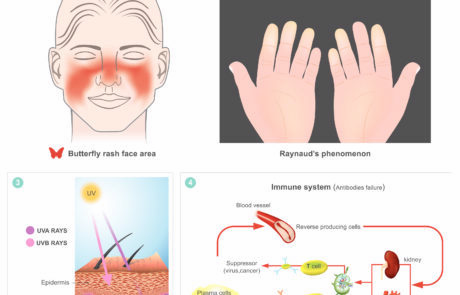 For example, in mild hypersensitivity vasculitis due to a drug, discontinuing the offending drug may be adequate, along with antihistamines and observation. The goal of treatment is to induce remission, to minimize drug toxicity and to monitor for signs of recurrence. You can find more information about vasculitis Here. Behcet’s syndrome is a rare autoimmune condition. The cause is unknown, but in some cases it runs in families due to a genetic predisposition. Other contributing factors include infections and environmental exposures. The disease results in an attack of the immune system on mucosal surfaces, skin, joints, and blood vessels. 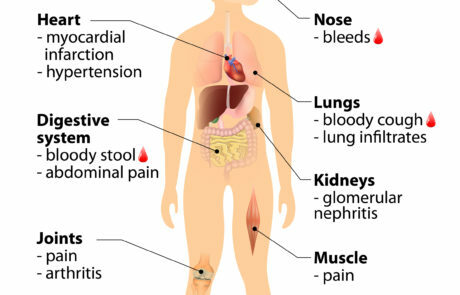 Symptoms can include mouth and genital sores, rashes, joint pain and swelling, fever, and inflammation of the blood vessels, causing damage to organs. The inflammation of the blood vessels ranging from small arteries to large ones, as well as veins. Because of the diversity of vessels affected, this syndrome can manifest in numerous locations in the body. A diagnosis is generally achieved by a thorough history, physical exam, and supporting lab work. In addition, there is sometimes supporting radiology studies or skin biopsies performed depending on the presenting symptoms.